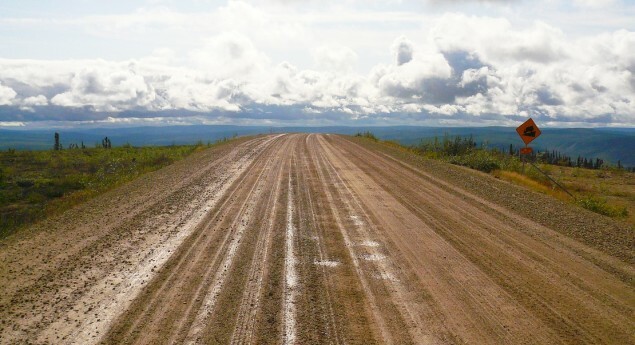 Starting in the Yukon and finishing in the Northwest Territories, the Dempster Highway has one end outside of Dawson and the other above the Arctic Circle in Inuvik. Photo Credit: The Dempster Highway, also referred to as Yukon Highway 5 and Northwest Territories Highway 8, is a Canadian highway that connects the Klondike Highway in the Yukon to Inuvik, Northwest Territories on the Mackenzie River delta. The Dempster Highway begins east of Dawson City, Yukon and extends to Inuvik, Northwest Territories . Much of the highway follows an old sled-dog trail. This photo was taken a little bit past Eagle Plains, one of the few communities along the highway with fuel and lodging services. A sign near Eagle Plains states the it has a population of 18. 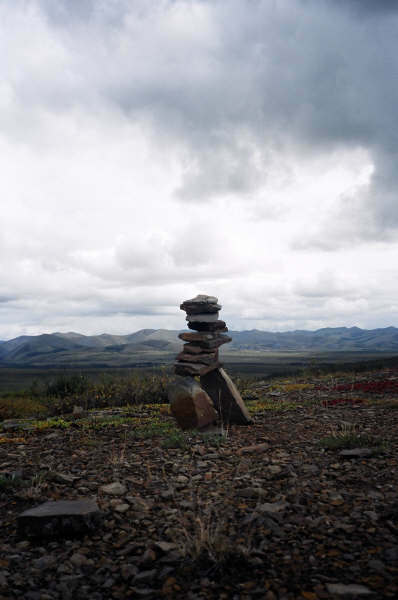 An inukshuk is a human-made stone landmark or cairn used by the First Nations population in the Arctic region of North America. How dusty is your car? “I drove the Dempster.” A phrase uttered with pride, often accompanied by a dusty and hardy vehicle, the Dempster is one of the iconic highways in Canada. It starts (depending on your point of view) near Dawson City, and it takes you up and into the Arctic Circle. Welcome to the Land of the Midnight Sun. Photo: The Dempster Highway, also referred to as Yukon Highway 5 and Northwest Territories Highway 8, is a Canadian highway that connects the Klondike Highway in the Yukon to Inuvik, Northwest Territories on the Mackenzie River delta.